Aaaanyways, this is a recipe that I've been meaning to post for a while now (at least a year) and haven't gotten around to it, but the day has finally come! It's my favorite banana bread recipe ever, and I've definitely tried my hand at quite a few. It's from (pretty much my favorite) cookbook, Flour. Everything I've made from that book has been awesome, I'd absolutely recommend adding it to your bookshelf if you haven't already. One piece of advice on this recipe - don't omit the walnuts. 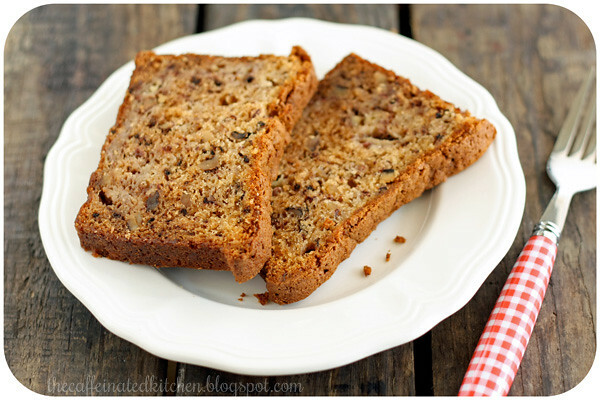 I usually detest nuts in my banana bread but for some reason they go so well with this version. Position a rack in the center of the oven and preheat to 325 degrees F. Butter a 9x5-inch loaf pan. Using a stand mixer fitted with the whip attachment, beat together the sugar and eggs on medium speed for about 5 minutes, or until light and fluffy. On low speed, slowly drizzle in the oil. (Do not pour in all at once! Adding the oil should take about 1 minute.) Add the bananas, creme fraiche/sour cream, and vanilla and continue mixing on low speed just until combined. Using a rubber spatula, fold in the flour mixture and nuts just until thoroughly combined. (No flour streaks should be visible and nuts should be evenly distributed.) Pour the batter into the prepared loaf pan and smooth the top. Bake for 1 - 1 1/4 hours, or until golden brown on top and the center springs back when you press it. Let cool on a wire rack for at least 30 minutes, then remove it from the pan to finish cooling. The banana bread can be stored tightly wrapped in plastic wrap at room temperature for up to 3 days. For longer storage wrap tightly in plastic wrap and freeze for up to 2 weeks; thaw overnight at room temperature.